Rob Costello is a journalism student at the George Washington University. He is a past member of the Division 1 baseball team at GW, and has been writing about subjects surrounding the MLB and other major sports for the past five years. Costello is an expert on pitching mechanics, baseball-specific exercises and the culture of baseball in general. Baseball is one of the most popular sports in the world. Although there are a few variations in game rules due to age differences and other factors, the basic rules are largely the same no matter where a game is being played or who is playing it. Although there are many nuances to baseball's regulations, several rules provide the basic structure. Baseball is played on a field with four bases. The bases are arranged in the shape of a diamond, 90 feet apart from each other. In the middle of the diamond is the pitcher's mound. The pitcher begins his pitch with his foot on the pitching rubber, which is 60 feet, 6 inches from home plate. Distances between bases and from the mound to home plate may be shorter when younger participants are involved. In Little League, home plate is 46 feet from the pitching rubber, and bases are 60 feet apart. Typically, in professional baseball, a fence anywhere from 300 feet to 400 feet from home plate marks the boundary of the field. At the professional and collegiate levels, there is no time limit for games. Games are over when nine innings are completed, whether it takes two hours or 10. In high school and youth leagues, time limits may be installed by the leagues that have jurisdiction. Having a "time limit" means that a new inning may not start after the time has expired. The batting team tries to score as many runs as it can before the team in the field can record three outs in a given inning. When three outs are recorded, a team's time at bat for that inning ends. There are numerous ways to record an out. The batter can hit the ball and have it caught before it hits the ground (called a fly out). The batter can also hit the ball on the ground, and if the fielder throws the ball to a player touching the base before a runner forced to try to advance gets there, the runner is out (called a ground out). Tagging a player from the batting team with the ball while that player is not on a base is another way to record an out. A strikeout is also a way to record an out. Getting outs is the main goal of the pitcher and the team in the field. When the fielding team records three outs, the inning ends. The team that was hitting then goes in the field, and the team that was in the field takes its turn at bat. If a pitcher throws three strikes (pitches either in the strike zone, or pitches missed by the batter when he swings at a pitch), the batter is out. If a pitcher throws four balls (pitches out of the strike zone in which the batter does not swing), the batter is awarded first base. A foul ball (hit outside the boundaries of the field) is counted as a strike against the batter until there are two strikes, at which point subsequent foul balls do not count as strikes. The exception is if the batter attempted to bunt when he already has two strikes against him. A foul ball in that instance is recorded as a strikeout. When a runner gets on base, usually by hitting the ball and reaching base safely or earning a walk, it is the next hitter in the lineup's job to "drive him in." 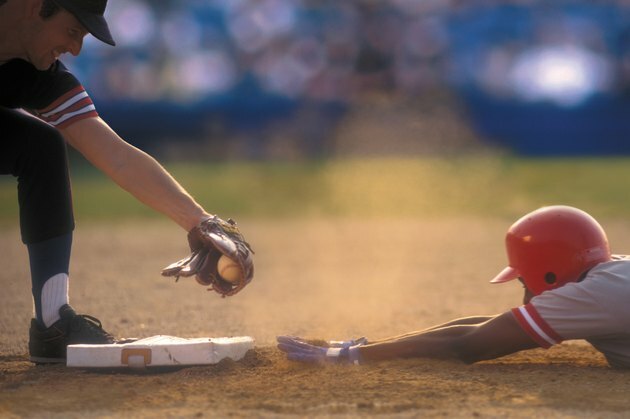 A run is scored when a runner crosses home plate safely; either being driven in by a hit, an error, a fielder's choice, or a walk with the bases loaded. A batter can score a run by himself by hitting a home run, usually accomplished by hitting a ball over the outfield fence. If a home run is hit, the batter and everybody on base scores. The team that scores more runs over the course of nine innings wins the game. Once a runner is on base, he may attempt to steal the next base in professional baseball and many higher levels of the game. A runner does this by making a dash for the next base once the pitcher pitches the ball. After the pitcher releases the ball, it's the catcher's job to receive the ball and throw it to the base the runner is trying to steal. If a fielder receives the throw and tags the runner before he reaches the base, the runner is out. A pitcher can try to counter a stolen base by attempting to "pick off" the runner instead of pitching. Picking off consists of making a throw to the base the runner occupies before he steals, hoping to catch the runner off the base. If the pitcher makes any move to deceive the base runner, a balk is called, and the runner is awarded the next base. How Far Apart Are the Bases in Fastpitch 10U Softball?